Denver-based technology research firm Janco Partners, Inc. today released a study profiling the international browser and operating system market. The study shows that in the less than seven months that Windows 7 has been available, it has already attained a 14.8% share of the international OS market. 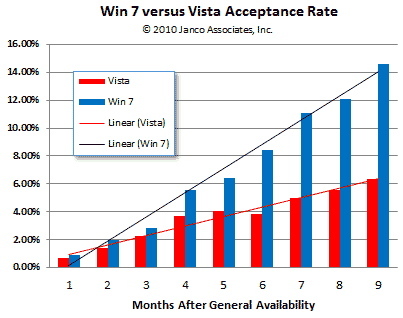 "There are now more users of Windows 7 than Vista. That is a major factor in their improved record earnings. The last OS that was accepted as quickly in the market was XP," Janco CEO Victor Janulaitis said in a statement today. "Vista's market share has peaked, and is in the process of being decommissioned in most enterprises." "The last six months have been a mixed bag for Microsoft," Janulaitis added. "While they have good news on the OS front, their browser market share has fallen to the level that it was in 1998." These decreased levels are no doubt related to Microsoft's unbundling of Internet Explorer in Windows 7 in Europe. But despite any decreases, Janco still places Internet Explorer at the top of the market with a massive 67.73% usage share. Firefox comes in a distant second place with 17.88%.